So WHY doesn’t it LOOK clean?! Recent statistics show that Americans spend over 60 minutes each day with house cleaning tasks. I don’t necessarily love cleaning…it’s one of those things that has to be done. But if I’m going to expend that much time and energy cleaning my house, then by golly, I want it to LOOK clean! SHORT ON TIME? 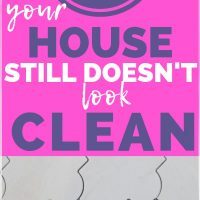 SAVE TO PINTEREST NOW & READ ABOUT THINGS MAKING YOUR HOUSE STILL LOOK DIRTY AFTER YOU’VE CLEANED! Do you have to move piles of things from the sofa just to sit down? Do you have to clear clutter from the table in order to enjoy a family meal? If so, you may have way too much stuff. Take a look around and see if any of these 18 things are cluttering up your home. If you need to clear the clutter from your entire house quickly, then this decluttering planner will make sure you don’t miss a thing. Our house was built in 1970 and we bought it about 3 years ago. Many updates had been made…beautiful plantation shutters, a large office add-on, energy efficient, double hung windows, and so on. 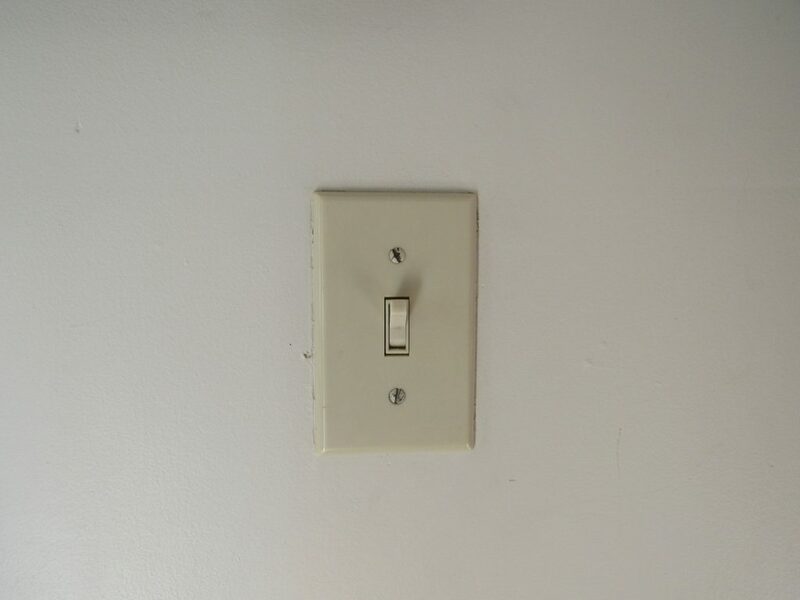 But a seemingly simple home upgrade that had not been addressed were the old, almond colored, (some paint spattered) outlet covers and light switch plate covers. They were such an eyesore and no amount of cleaning was going to change that. Outlet covers that DO NOT require any rewiring. These babies fit right over the old existing outlet to give everything a clean and cohesive look. This was such a simple house cleaning tip to make our home look fresh and clean! I used to feel like all I did was laundry. I tried the ‘wash a load every day’ method and was miserable! Laundry baskets of clothes sitting around your house makes it look dirty…even if the clothes are clean. I revamped my entire laundry routine and now I only do laundry ONE day each week (for 4 people). It has seriously been a game changer! I get everything washed, dried, and put away in ONE day. I don’t even think about laundry for 6 days in a row!! If you have enough pillows and blankets for an entire elementary school to build forts then it’s probably time to get rid of some. Your home will look messy if you have throw blankets and pillows scattered everywhere. Taking a few seconds to fold blankets and straighten pillows will instantly make your home look cleaner. You can hide all those blankets in a functional little storage ottoman and extra pillows can live in a cute basket. Paper will ruin your tidy house so quickly. Paper keeps coming in so you have to put a system in place before the paper-pest takes over. 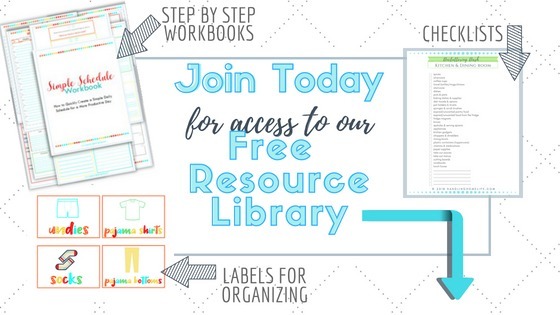 Kaitlin at The Simply Organized Home has a fantastic post on how she organizes all of the paper in her home. It drives me bonkers when the hand soap or dish soap bottles have soap and water splattered on them. It can make the cleanest sink area still look dirty. 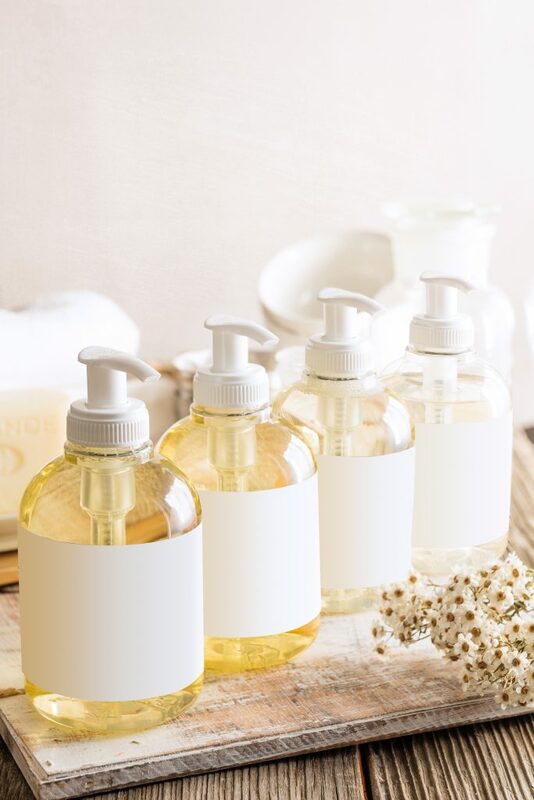 Give the bottles and spouts a quick wipe down and everything will look nice and clean! When cleaning my house I not only want things to look and feel clean, but I want to do so WITHOUT Toxic cleaners. There are many non toxic ingredients you can use to safely clean that you probably already have at home. Safe, healthy cleaning is extremely important to me, but so is convenience. I like to make life easier whenever I can! It’s a little bit of a pain to pull out all the supplies and mix up cleaners (a pain I’m happy to endure for my family’s health), but I’m always hopeful when I see a newly advertised cleaner with big promises! 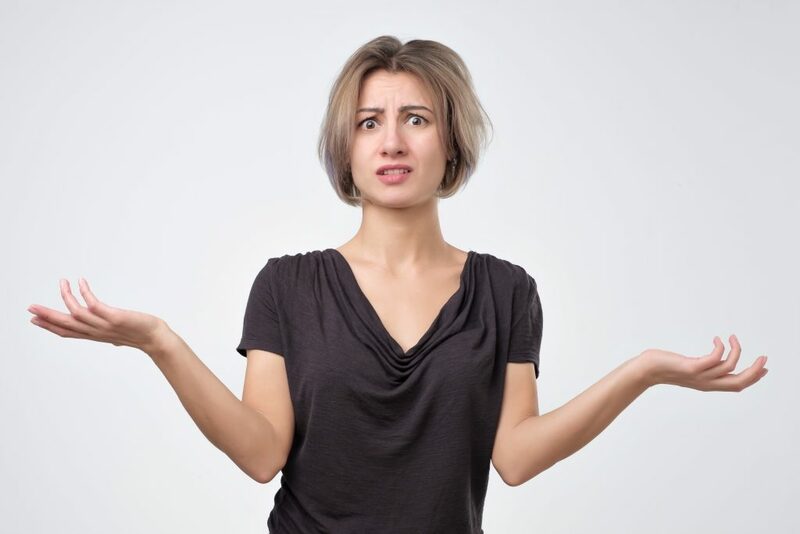 From time to time, I used to buy and try whatever new cleaner claiming to be “natural” and “non-toxic”–even with the outrageous price tag. Time after time I’m disappointed. After one use, I’m wheezing and have a pounding headache. Then, I have a practically full bottle of expensive cleaner left that I can’t even use. 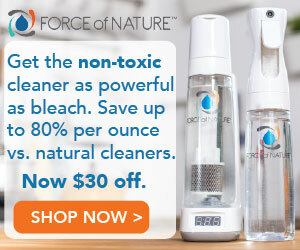 When I started seeing ads on Facebook for the cleaner called Force of Nature, I was intrigued. They make bold claims but the price tag seemed pretty bold as well! I sure didn’t want to pay that much money for another cleaner I can’t use. When I saw that Force of Nature has a 100% happiness guarantee, I was sold. I could have 30 days to try it and if not happy, I could send it back for a refund which gave me peace of mind. So, when buying Force of Nature for the first time you get a starter kit with the activator base, spray bottle, and 5 activator capsules which is enough to make 5 bottles of cleaner. Then you only purchase activator capsules in the future. For the first time EVER, I’m able to easily clean my home without becoming ill and without compromising my family’s health with toxic chemicals. I love not having to drag out all of my cleaning ingredients and mix up cleaners. Force of Nature has replaced all of those! I use it to clean everything and it’s completely safe to use around the kids and pets. These unsightly little holes can sabotage the cleanest of homes. I like to rearrange my wall hangings and wall decor from time to time but can’t stand the look of a hole left where a nail used to be. So, I would rarely change my wall decor to prevent having to deal with holes in the walls. Or, I would hang things in weird places in order to COVER the ugly hole! 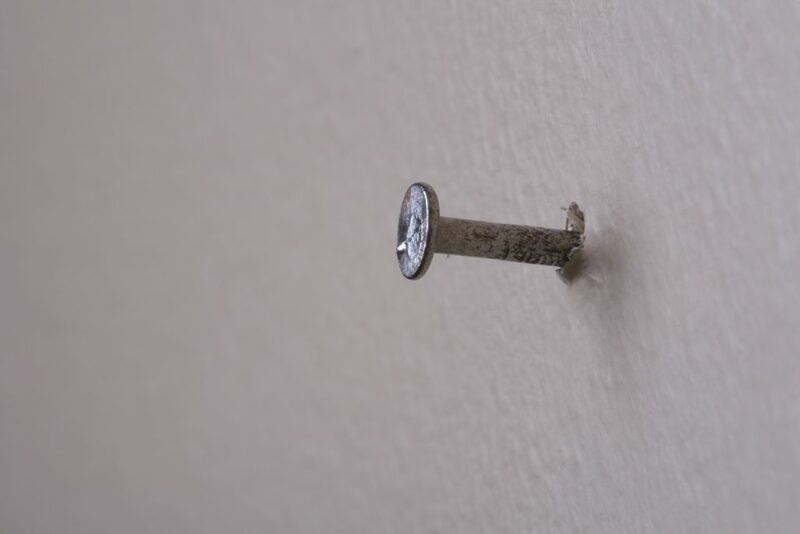 Luckily, it’s not at all that difficult to cover nail holes in the walls. All you need is some spackling, small putty knife, small paint brush, and paint to match. If you have kids then you know exactly how quickly the house can go from clean to disaster! Make sure to have systems in place for all of the kid’s things. Placing a basket or shoe shelf next to the door for shoes can prevent dirt from being tracked onto your clean floors. Put step stools at the sink so kids can easily wash their hands before dirty little fingerprints are all over everything. It’s never too soon to begin teaching children how to clean and to do chores in the home. Not only will it help your home look and feel clean, but your kids are learning valuable life skills they will need forever. Even with regular vacuuming and dusting, the glass light covers and globes can still look dingy. Once a year I take all of the light covers down and give them a soapy bath. They look sparkling clean and the whole house looks brighter! When we first moved into this house, I scrubbed the grout on our tile floors with just about every cleaner out there and it still looked terrible. I knew it was clean, but I still cringed every time I saw the discolored, stained grout. It was going to be awhile before we could redo the floors, so I had to figure out a way to live with the ugly grout. Luckily, I found an affordable solution! Grout Refresh is a grout colorant and sealer. It comes in many different colors you can choose from and is incredibly easy to apply. 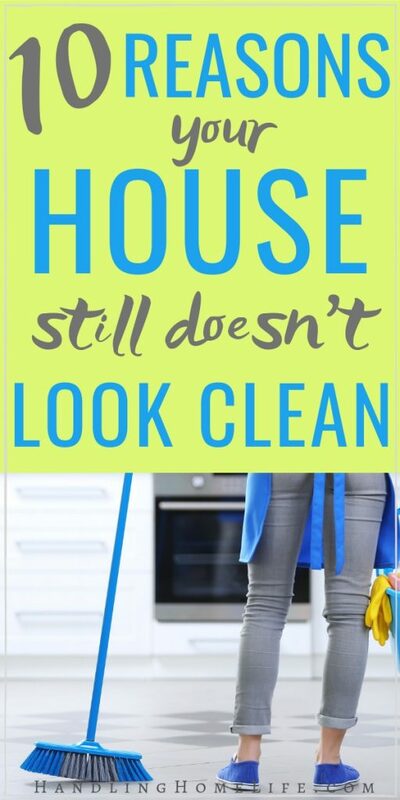 This little house cleaning tip makes all of your cleaning efforts shine! 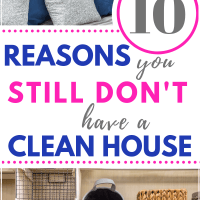 What’s preventing your home from looking clean? Be sure to let me know in the comments! I like to use my dishwasher for cleaning all the glass globes in my home, and disinfecting toys for kids (I put them in a lingerie bag for the smaller ones.) Saves time and money. Mary, what a great idea! I’ve used the dishwasher for toys but never thought to do the glass globes in the dishwasher! I will most definitely be doing this!